Planning a beach wedding is fun, not only do you have the happiness of planning a wedding. However, the fun element becomes more since this is taking place at a beach. One of the best things about beach weddings is that you do not have to invest too much on the decor. The natural beauty of nature on its own is more than enough to make up for a lot of decorations. A beach wedding is a fun concept that can easily be pulled off if it is planned well. No doubt, there is a lot that goes into the planning since this is a very special day, however, if you do things in an organized manner and stick to the basics, it will be a success. Unlike any other wedding, a beach wedding does require a lot of thinking so that you do not miss anything. At the same time, you also have to make the budget for your wedding based on the extras that come along with it. Here are a few ways to make it easy for you while you are planning your beach wedding. The one thing that hardly blends in with the beach wedding concept is a traditional wedding gown. Instead of that, you can take it light and opt for a nice full-length wedding dress. If you do want to have a few pictures in a traditional gown, then you can choose a venue close to the place and have a small photo session there. Chiffon and other such light materials will be the right choice of fabric for your special dress. Since this is a beach wedding, choosing the right theme is important. While you are making this decision, keep the decorations as elegant and natural as possible. You have a choice to stick to a natural theme like flowers and plants, or you can also take it to a fun styled beach party theme, which can also be part of your reception. In many countries, you would require a permission to get married on the beach, it is important to get all the information you can on this front so that nothing comes on the way of your special day. A good alternative would be to choose a beach resort as a wedding venue as it saves you a lot of trouble and running around. These resorts are not only located by the beach, but also have a private section for their guests. 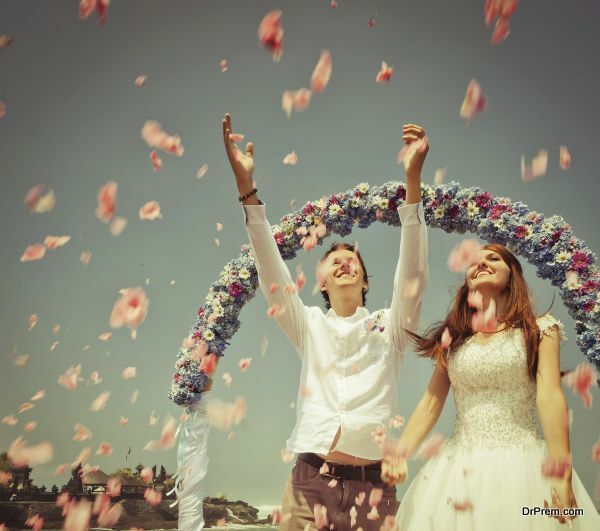 Most of the time, summer is the ideal time for a beach wedding, however, there are some couples who decide their wedding during other seasons as well. Depending on the season when you wedding is scheduled, you need to make the relative arrangements so that you are covered properly. For example, if your wedding is during the rainy season, you need to ensure that you have a waterproof tent or a shade just in case it rains. Have a plan-B in place so that you do not end up with a wedding disaster. It is always advisable to have a light menu during a beach wedding. 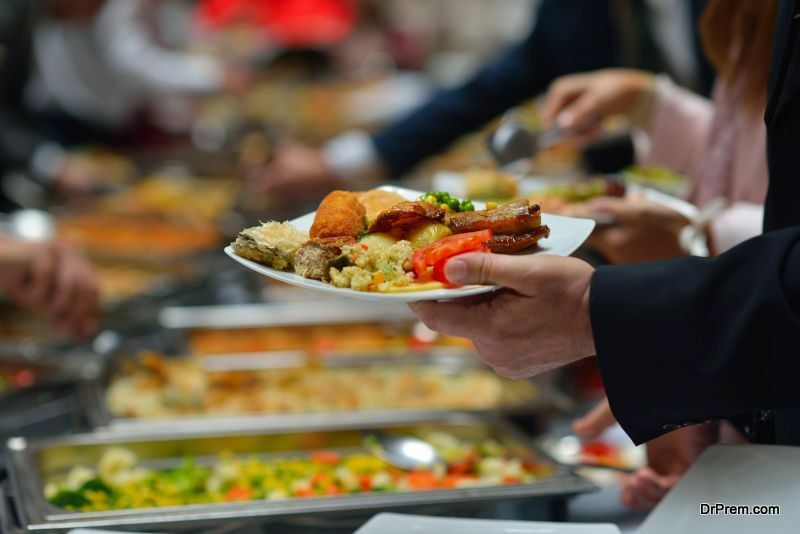 Considering the climatic conditions, too much of food can make your guests sleepy while too less can also be equally bad. Your menu should consist more of salads, natural fruits, BBQ’s, or even roasted items. This will not only ensure that your guests are full, but also keep it light on their stomach. A beach wedding can become even better when you include a few games and water activities. You do have the dance factor coming in, but you can make it more fun by incorporating a few games. A perfect way to break the ice between the two families would be to have competitive games between the people who are from the groom’s side and those from the bride’s side. This will also help both the extended families to feel comfortable with each other and create memorable wedding moments. Your venue should be accessible and have all the necessary facilities that your guests would need. For example, if you have guests who are physically challenged or elderly people, then make sure that you have the arrangement in place so that they do not have a tough time. Similarly, choose a spot that is close to a parking space so that your guests do not have to walk quite a lot. Even have a shoe stand where your guests can safely keep their shoes.